If I need an immediate answer to my query, whom should I contact? Apart from this participants can also call during office hours (9 A.M. to 5 P.M.) on thenumber provided on thewebsite: +91-120-4538458. This mail should be done via. team E-mail ID only through Team Representative. Queries placed by individual members of the team using their personal E-mail IDs will not be entertained. Once the query has been placed it will be answered within 48 hours. Note: Participant Relationships Manager are thebusy person they have other affairs to handle too. Thus it is recommended that teams should mail their queries first and if it is unanswered within 48 hours then they should call. If thecall is placed before that then it will not be entertained unless it is a matter of utmost importance. What kind of queries can I ask via E-mail ID provided in the question above? Queries related to registration and participation requirements. Queries related to conducting of theevent like – schedule, venue, deliverables expected, and reports. Queries related to handbooks provided. Apart from this no other queries would be entertained. Why is it necessary to form a team ID? It is necessary to have a single team Email ID, so as to minimize the risk of miss communication between the teams and the organization, as we have received several grievances in the past. For this, we have appointed Participant Relationship Manager from our side, who will be sole representation of the organizing committee of ESVC while communicating with participants. Similarly as mentioned under Participation Requirements, the teams should appoint a Team Representative from their side, who will be responsible for all the communication between theteam and the organizing committee of ESVC. We expect only team representative to communicate with us (whatever the communication method might be – by E-mail or by call)in any case so that there is minimal risk of miss communication. I have not registered yet, and I don’t have any team ID, how can I communicate? Most of the information regarding the event has already been provided on the website either on by a link or by documentation. However, if you still have any queries you can mail it to your personal Email ID or you can call on the number provided. It is recommended for a single person to communicate regarding the query. Once the team has been registered, queries from personal E-mail IDs will not be entertained as mentioned above already. When and where will the event be conducted? The event schedule has already been provided on the website. The venue of theevent will be announced accordingly and teams will be intimidated through E-mail. However, if there is any change in schedule teams will be informed prior through E-mail. Can I use everyday use helmet or Motor Bike Racing Helmet for this event? No, maybe these helmets are already certified for use on road, but for this event, teams have to use specifically certified helmets – Snell K2000, K2005, K2010, M2000, M2005, M2010, SFI 31.2A, SFI31.1/2005-FIA 8860-2004, FIA 8860-2010. Open faced helmets are not allowed for use. Can you clarify me about how many members should have driver’s safety gear? As it is a single seater vehicle, only one driver will drive during the endurance. However, if teams asthere are two drivers from each team, then both should have their own complete safety gear which they have to present in front of Technical Inspector during thesafety check. As it has occupancy of more than one, i.e. ; driver + passengers will be seated in the vehicle. And during the dynamic event, as it is mentioned all the occupants must be present in the vehicle, thus passengers and driver should have complete safety gear. Example, if a team has built a vehicle with occupancy of 4 (1 driver + 3 passengers). So during dynamic rounds, 3 team members and 1 driver will be seated in the vehicle. Thus along with the driver, rest of the 3 team members should also have complete driving safety gears, which they have to present in front of the Technical Inspector. I participated in ESVC last year, this year by same team name I am going to participate. Can I get an extra advantage of that during the event? No, it maybe that you have been participating in ESVC, but this does not give you any advantage over registration process or during the event. We at ISIE-India does not promote such kind of activities. You have to undergo the same procedure, from registration to final endurance as other teams. My vehicle got its Technical Inspection cleared the least time. Is it necessary for me to get my vehicle’s Technical Inspection? Your vehicle may have cleared technical round, but each year there are some modifications in the rules. Your vehicle needs to undergo technical scrutiny. I already have an Electric Solar Vehicle, made for last year’s event. Also, it performed well, can I make use of that same vehicle this year also? You can make use of an Electric Solar Vehicle made earlier by you or your teammates. But this vehicle must be in accordance with the rulebook provided. Also, the teams must first perform some significant changes to the vehicle. These changes must be mentioned in Group A documentation, it will also be checked during the dynamic event. If no significant changes are made in the vehicle then the Technical Inspector has all the rights to take necessary actions. We have made already made an electric vehicle which is of superior performance, can we bring that vehicle to your event? 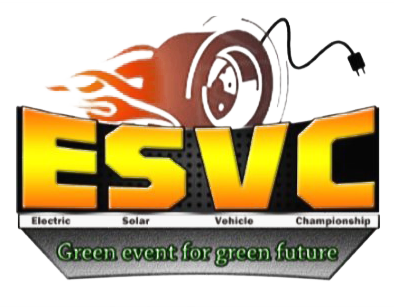 As the event, ESVC is a competition for a specific kind of vehicles, designed under specific constraints. As long as the vehicle you made complies with the rulebook it is admissible in the event. The team should mention all the details and calculations in the report like every other team. If we find it binding to the rulebook, we will allow the vehicle or else teams have to build another vehicle if they want to participate. We are regretful for not being able to provide a platform to showcase your vehicle or invention, however, you can try that in other significant events of ISIE-India or any other organization. Will there be any arrangements for performing test runs at event venue during the dynamic round? We know that every team will be excited to perform a test run and check their vehicle and its power unit before the event. But regretfully, currently, we cannot provide that. Teams would have to perform all the test runs at their Institute before arriving for the event. It is mentioned in therulebook that for adventure class, during solar performance test the vehicle would be made to run directly on solar power. Is it necessary? What happens if the vehicle is unable to do so? Yes, we have mentioned for adventure class – the vehicle should run by direct solar power under solar performance test. However, if thevehicle is unable to complete the given stretch of 50m, (in thefully loaded state,i.e. ; batteries will be intact, but it should be disconnected) DNF will be marked. But this will cause theteam to lose points for that round, but they can still go for endurance round. Also, teams must ensure that the solar panel is able to charge the batteries, this will help them during endurance. Is it necessary to provide ventilation for batteries and motor? Yes, it is necessary as this year for both adventure and professional class we have closed body, thus ventilation should be provided to extract heat from the batteries and motor. Ventilation source can be natural or forced.